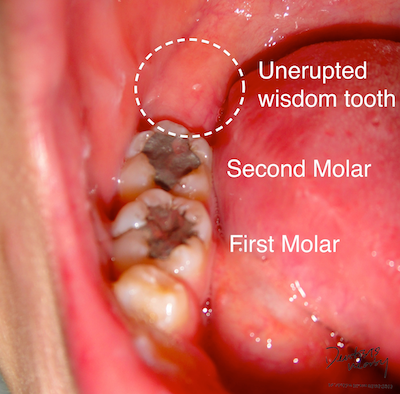 Caption: the picture above shows no sign of eruption 3rd molar visually, which can be deceiving as most impacted wisdom tooth cannot be seen visually. 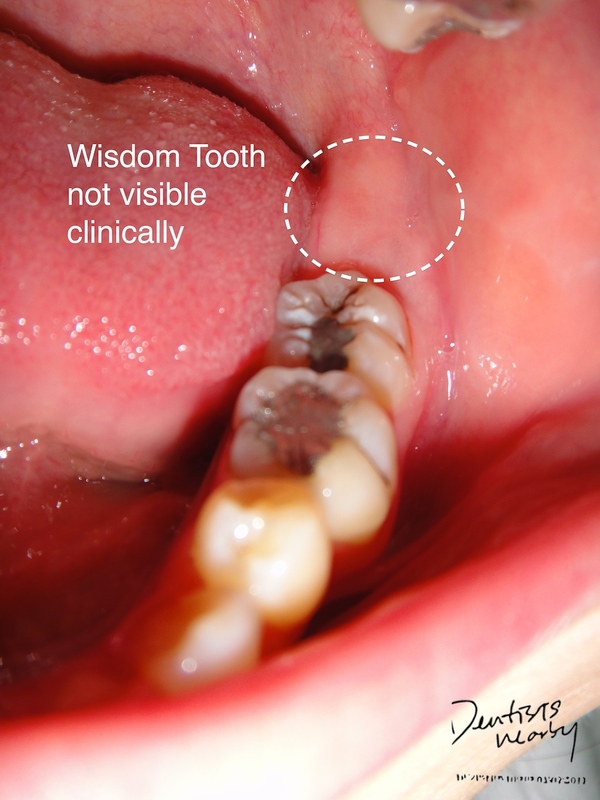 An oral and maxillofacial surgeon can remove (extract) a wisdom tooth. The procedure often can be done in the dentist or surgeon's office. You may have the surgery in the hospital, especially if you are having all your wisdom teeth pulled at one time or if you are at high risk for complications. If you have any infections, surgery will usually be delayed until the infection has cleared up. Your doctor or dentist may have you take antibiotics to help heal the infection. Before removing a wisdom tooth, your dentist will give you a local anesthetic to numb the area where the tooth will be removed. A general anesthetic may be used, especially if several or all of your wisdom teeth will be removed at the same time. A general anesthetic prevents pain in the whole body and will cause you to sleep through the procedure. Your dentist will probably recommend that you don't eat or drink after midnight on the night before surgery so that you are prepared for the anesthetic. To remove the wisdom tooth, your dentist will open up the gum tissue over the tooth and take out any bone that is covering the tooth. He or she will separate the tissue connecting the tooth to the bone and then remove the tooth. Sometimes the dentist will cut the tooth into smaller pieces to make it easier to remove. After the tooth is removed, you may need stitches. Some stitches dissolve over time and some have to be removed after a few days. Your dentist will tell you whether your stitches need to be removed. A folded cotton gauze pad placed over the wound will help stop the bleeding. In most cases, the recovery period lasts only a few days. Take painkillers as prescribed by your dentist or oral surgeon. The following tips will help speed your recovery. Bite gently on the gauze pad periodically, and change pads as they become soaked with blood. Call your dentist or oral surgeon if you still have bleeding 24 hours after your surgery. While your mouth is numb, be careful not to bite the inside of your cheek or lip, or your tongue. Do not lie flat. This may prolong bleeding. Prop up your head with pillows. Try using an ice pack on the outside of your cheek for the first 24 hours. You can use moist heat-such as a washcloth soaked in warm water and wrung out-for the following 2 or 3 days. Relax after surgery. Physical activity may increase bleeding. Eat soft foods, such as gelatin, pudding, or a thin soup. Gradually add solid foods to your diet as healing progresses. Do not use a straw for the first few days. Sucking on a straw can loosen the blood clot and delay healing. After the first day, gently rinse your mouth with warm salt water several times a day to reduce swelling and relieve pain. You can make your own salt water by mixing 1 tsp (5 g) of salt in a medium-sized glass [8 fl oz (240 mL)] of warm water. Do not smoke for at least 24 hours after your surgery. The sucking motion can loosen the clot and delay healing. Also, smoking decreases the blood supply and can bring germs and contaminants to the surgery area. Avoid rubbing the area with your tongue or touching it with your fingers. Continue to brush your teeth and tongue carefully. Your dentist will remove the stitches after a few days, if needed. Your jaw may not be large enough for them, and they may become impacted and unable to break through your gums. Your wisdom teeth may break partway through your gums, causing a flap of gum tissue to grow over them. Food and germs can get trapped under the flap and cause your gums to become red, swollen, and painful. These are signs of infection. More serious problems can develop from impacted teeth, such as infection, damage to other teeth and bone, or a cyst. Crowding of the back teeth. Gum disease and tooth decay in the wisdom tooth, which may be harder to clean than other teeth, or in the teeth and jaw in the area of the wisdom tooth. Pain and swelling in your gums and tooth socket where the tooth was removed. Bleeding that won't stop for about 24 hours. Difficulty with or pain from opening your jaw (trismus). Damage to existing dental work, such as crowns or bridges, or to roots of a nearby tooth. A painful inflammation called dry socket, which happens if the protective blood clot is lost too soon. Numbness in your mouth and lips after the local anesthetic wears off, due to injury or inflammation of nerves in the jaw. A fractured jaw if the tooth was firmly attached to the jaw bone. An opening into the sinus cavity when a wisdom tooth is removed from the upper jaw. Dental surgery may cause bacteria in the mouth to enter the bloodstream and cause infections in other parts of the body. People who have difficulty fighting off infections may need to take antibiotics before and after dental surgery. Such people include those who have artificial heart valves or were born with heart defects. Anesthetic (local and/or general) almost always is used during the extraction procedure. All surgeries, including oral surgery, that use general anesthetic have a small risk of death or other complications. Caption : The X-rays above shows how slowly the roots of a 3rd molar would form. 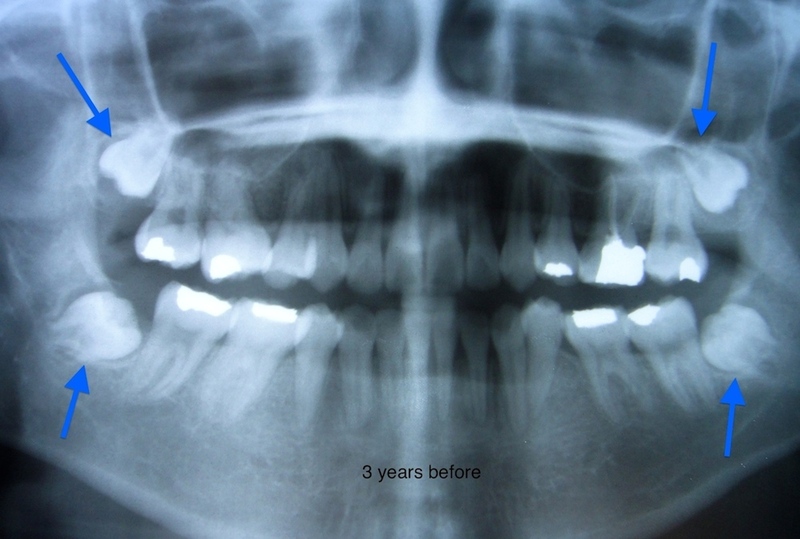 Those X-rays are 3 years apart. You may never have any problems with your wisdom teeth. It is rarely harmful to your health to have your wisdom teeth removed, but there are slight risks involved with any surgery. In younger people (late teens and early 20s), the wisdom tooth's roots are not fully developed and the jaw bone is not as dense, so it is easier to remove the tooth. The easier it is to remove the tooth, the easier your recovery is likely to be. Most problems with wisdom teeth develop between the ages of 15 and 25. If you are older than age 30, you have only a small risk of having problems with your wisdom teeth. Few people older than 30 develop problems that require removal of their wisdom teeth. Medical insurance does not always cover this procedure. If you have a medical condition that may get worse over time and your teeth may cause problems, consider having your wisdom teeth removed while you are healthy. Possible complications include dry socket (alveolar osteitis), infection, bleeding, and numbness. Women on birth control pills who decide to have their wisdom teeth removed should try to schedule the surgery for the end of their menstrual cycle (usually days 23 through 28). There seems to be less risk of dry socket during this time. Damage to dental work, such as crowns or bridges, or to roots of a nearby tooth. A painful inflammation called dry socket. Numbness in your mouth and lips after the local anesthetic wears off, due to injury or inflammation of nerves in the jaw. Numbness will usually go away, but in rare cases it may be permanent. Note: Pictures and X-rays are all taken from the same volunteer with consent.